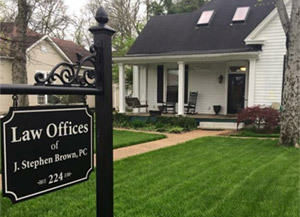 At the law offices of J. Stephen Brown, PC, our goal and guiding principle has always been, and will always be, providing great professional service for a reasonable price, in a timely and courteous fashion. Whether it be drawing up a will, negotiating a settlement, or trying a difficult case, our clients are all treated with the competent one-on-one personal service that they deserve. Although Lebanon has grown at a tremendous rate over the last few years, the small town personal service provided by this law firm still sets it apart. In 31 years of practice, the old adage still rings true: Treat people as we, ourselves, would want to be treated. Going to a lawyer’s office shouldn't be intimidating. When you walk in our front door, you will immediately sense a warm, comfortable feel to the office setting. Our friendly staff will do everything they can to make you feel right at home. Our experienced attorneys will then meet with you, allowing as much time as is needed to learn about and understand your situation. The two of you will then work together to formulate a plan as to how best to achieve your needs and goals. At the law offices of J. Stephen Brown, PC, we do understand that the most important case is your case. When you retain us, you retain experienced professionals who promise to work hard on your behalf, to keep you informed throughout the process, and to make every effort to see that your work or case is completed quickly so that you can move on to other things in your life.